Shasta Teens Drive Safe is a county-wide program in Shasta County that educates teens about the dangers and consequences of impaired and distracted driving. The program disseminates messages to teens through educational campaigns, traffic safety events, community events, and educational activities on school campuses. 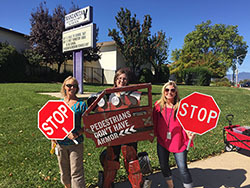 Activities urge teens to drive responsibly, walk safely, and be responsible passengers. Funding for this program was provided by a grant from the California Office of Traffic Safety, through the National Highway Traffic Safety Administration. Contact Carmen Schuette at (530) 229-8424 or cschuette@co.shasta.ca.us to have the Shasta Teens Drive Safe program brought to your school. 1. Host Shasta Teens Drive Safe at your school. 2. Take photos/video of students participating in games and activities that the program offers. 5. Upload your photo/video and a brief description of the activity (including the date of completion and any people pictured in the photo).